Robert Mueller and the US Attorney for the Southern District knows MORE about this than ANY of us know…. Lying to Congress is a crime…. In criminal law, a conspiracy is an agreement between two or more persons to commit a crime at some time in the future. Criminal law in some countries or for some conspiracies may require that at least one overt act be undertaken in furtherance of that agreement, to constitute an offense. There is no limit on the number participating in the conspiracy and, in most countries, no requirement that any steps have been taken to put the plan into effect…. This revelation is not the first evidence to suggest the president may have attempted to obstruct the FBI and special counsel investigations into Russia’s interference in the 2016 election…. There are some Trump lawyers that are looking over their shoulders…. The feeling that IF Cohen and other sources ARE to be believed? From a LEGAL point of view? 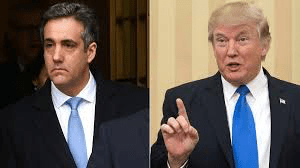 Trump has a LEGAL problem….